1. 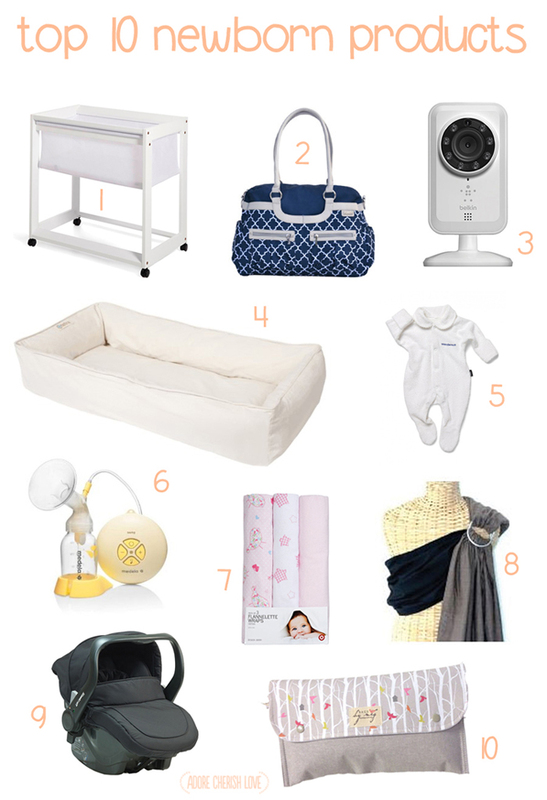 Boori Urbane Bassinet - We use this every single day for Lilly's daytime sleeps. I love that I can put her down and wheel her into whatever room I'm in! It's nice and long so she'll be able to use it for quite some time before we transition into her big cot. 2. JJ Cole Nappy Bag - I loooove this bag! It's cute and stylish and big enough to fit lots of baby essentials inside. You can read my review of this bag here. 3. Belkin Netcam - This baby monitor runs through your wifi and is compltely safe with password protection. You simply download the app to your smartphone and then log on through your phone. After Lilly's 6/7/8am feed, I put her back down either in my bed or her cosleeper and watch/listen to her through my phone while I have breakfast and express in the living room. 4. Tetra Snuggle Bed - This is probably my favourite newborn purchase ever! Lilly sleeps in this every single night next to me in our bed. I love that she's so close to me so I can hear her when she starts to stir before she starts screaming the house down hungry for food. It's not the cosleeper I had planned to buy and was a bit disappointed when my husband brought it home but it's seriously the best thing ever!! 5. Bonds Wondersuits - Lilly sleeps in these every night! She is a winter baby so I like having her in something nice and thick that I know will keep her warm all night...and there's nothing cuter than a newborn in a wondersuit! 6. Medela Swing Pump - I use this thing several times a day as an exclusive pumper. I love that it's portable - I can pop some rechargeable batteries in and I can take it out with me wherever I go. I do wish I had of gotten a double pump though so save time but this pump has been an absolute lifesaver. 7. Flannelette Wraps - We were given this beautiful set of flannelette wraps from Target and we use them every single day as well. They are squares so they are perfect for wrapping Lilly in and they keep her nice and warm. I loved them so much that I went and got the yellow and grey pack as well. We sometimes use them as a liner for her bassinet as well and use them as blankets when we're out and about. 8. Hugabub Ring Sling - Best invention ever! Lilly loves snuggling up to me in her sling when we're out and about. Sometimes I even wear her at home when she's having an unsettled day so that I can do housework hands free. It's especially handy when we hit the busy markets where there isn't enough room for our big pram. 9. Steelcraft Capsule - We love using our capsule - we can put Lilly in the car in the capsule and she almost always falls asleep. When we reach our destination, we take the capsule out and attach it to our pram without having to wake her. When we get home, I leave her to sleep in her capsule until her next feed. So handy! 10. Nappy Wallet by Bags by Meg - LOVE this nappy wallet and matching change mat. It fits perfectly in my nappy bag and I can fit 4 newborn nappies, wipes, disposable nappy bags and cream inside too. What products can you absolutely not live without?